Introduction – Rajim (राजिम) is probably the holiest place in Chattisgarh (छत्तीसगढ़) as it is situated at the eastern bank of Mahanadi (महानदी) river, just below its junction with Pairi (पैरी) and Sondhur (सोंढूर) rivers. Due to its location, on the junction of three rivers, it is often classified as Prayaga (Allahabad) of this region, Chattisgarh. Mahanadi enjoys the same status as that of Ganga in Chattisgarh hence taking bath and performing rituals at the bank Mahanadi is considered very sacred. Rajim-Mahatmya mentions that Mahanadi is known as Chitrotpala below its junction with Pairi and Utpalesvara before the junction. It is also believed that your journey to Jagannath Temple of Orissa is not complete if you do not visit Rajim. Mahashivaratri is celebrated with full faith and vigor. It used to be a show of three month in old days as perported by Beglar and Cunningham however at present the celebrations run for a month only. It is not only the holiest but one of the most ancient town of Chattisgarh. It has attracted historians, archaeologists and vivid travelers since ages and it continues to mesmerize you with its cultural, historical and social heritage. J D Beglar visited Rajim in 1871-72 and reported its antiquities. He was not allowed to enter inside the temples hence his account is very limited. Alexander Cunningham, who visited Rajim in 1881-82, describes it in detail. He tells that Rajim was a small village of about 3000 inhabitants and the holiest place of Maha-Kosala (महाकोशल), present Chattisgarh. Rajiv-Lochan (राजीव-लोचन) Temple, the main temple of this town, was visited by pilgrims on their way to Jagannath in Orissa. Richard Jenkins narrates a story about the name Rajim. When Rama did his ashvamedha, king Raju-lochana was ruling over Raju. When the sacrificial horse arrived at Raju, the king seized it and handed over to sage Kardama. Shatrughna who was accompanying the horse with his army tried to take it from sage Kardama but was reduced to ashes by him. Rama on hearing the news of the death of his brother soon reached Raju. However king Raju-lochana met him and obtained favor for him. Rama told the king that there are two deities at Raju, Utpaleshvar Mahadev and Nilkantheshvar. However as Shiva and Vishnu is same so he would make his abode here in worship of Shiva. Rama ordered the king to set up an image in his name and call it Raju-lochana. He further pleased rishi Kardama and got back Shatrughna to life. However there is no such story mentioned in Ramayana. Cunningham suggests that it would be a late invention of the brahmanas of Rajin to rival the claim of ancient capital of Manipur where ashvamedha horse of Yudhisthara was captured by Babhru-vahana. No inscription refer to name Rajim however some inscriptions mention name of a king, Jagat Pal, whose father, Sahilla, was the head of a race named Rajamala. Cunningham suggests that his city would be Rajamalapuram which later changed to Rajam or Rajim. Monuments – There are many monuments of interest at this small town. Rajiv-Lochan Temple – J D Beglar, who visited Rajim in 1871-72, mentions a tradition about naming of this temple. Rajba was a telin (oil dealer) who used to worship Narayana regularly. After 12 years of her worship, Narayana pleased over her and granted a boon. She replied, ‘My Lord, stay here always, and let my name precede yours.’. Hence Rajba telin’s name is first uttered in pronouncing the name Rajiv-Lochan. Some authorities told Richard Jenkins that previous to Rajib telin’s time Rajim was known as Kamal-kshetra or Padmapura. Cunningham also mentions similar tradition but with few more details. He writes that there was a telin in Chanda named Rajib or widow Raju. She had a black stone which she was using as a weight. King Jagat Pal had a dream about this stone and he got curious to acquire it to make a temple over it. He offered Rajib gold equal to the weight of stone in exchange of that black stone but she refused. At last she agreed to exchange the stone with queen’s nose ring and on promise that the temple should be named after her. Jagat Pal constructed this temple and named it after her name as per his promise. Cunningham mentions another tradition from a different informant. It states that Jagat Pal saw Thakur (Narayana) in his dream who asked him to get the black stone and put it in the temple. Rajib, who possessed that stone, demanded gold equal to its weight in exchange of the stone but Jagat Pal did not have that much gold. At last, Rajib agreed to exchange it for the nose ring of the queen. Jagat Pal put that stone in the temple. Rajib left Chanda and settled nearby this temple. Later she built her temple near the main temple. Sir Richard Jenkins also narrates similar story as above but in that he told that the stone recovered from Rajib was the original image of Rama Chandra. This stone was set up in the temple by king Rajiva-Lochana under his own name. Cunningham suggests that the temple was renovated during Jagat Pal’s time, 1145 CE, and the name of the temple was on that oil-dealer who gave the black stone which is now placed in a platter near the Vishnu image inside the sanctum. As copper plates of Tivara-deva were found about 5-6 feet underground this temple only so the temple would have been in existence by the time of Tivara-deva who is wrongly assigned to 425 CE by Cunningham but to eighth century CE by later authorities. Main entrance to the temple compound is from west however a small entrance is provided at north also. This courtyard is 147 feet in length and 102 feet in width. There are five temples inside the courtyard, central main temple and four shrines at four corners. Rajiv-Lochan shrine stands in center, shrine for Narasimha on north-west corner, shrine for Badrinatha on north-east corner, shrine for Vamana on south-east corner and a shrine for Varaha on south-west corner. Shrine at corners are small in size, 12 feet 4 inches square, and have similar shikhara as of the central temple. All the temples have their respective deities except the shrine of Badrinath which has an image of Vishnu. These shrines and the compound wall were constructed quite after the construction of the main temple. Entrance door on west is very heavily carved however this is a later construction. The entrance forms two chambers. There are five bands on door jamb, first and third have images of couples, second and fourth have foliage decoration and fifth has many acrobatic figures intermingled with creepers. There is an image of Sheshashai Vishnu in the center of the door lintel. Surprisingly, this image is a masterpiece in its category as many of its features point to Gupta craftsmanship. An image of Gaja-Lakshmi is placed just below the central image of Sheshashai Vishnu. With application of paint and oil has damaged the original features of the most of the images of this door. There is an image of Buddha placed on one corner of inner chamber. Local people identify this Buddha image with the image of the King Jagat Pal. The main temple in center is consisted to a garbha-griha (sanctum), antarala (vestibule) and an oblong mandapa. Usually we encounter a square mandapa in the temples of that time however there is an oblong mandapa at this temple and at Lakshmana Temple of Sirpur. This characteristic can be taken as a unique one in the architecture of Maha-Kosala region. The temple faces east and is built upon a jagati (platform) which is 69 feet long and 43 feet wide with a height of 8 feet. The temple, above this jagati, is 59 feet long and 25 feet wide. Mandapa is 38 feet long and 17 feet wide. Mandapa is open only on north and is approached by two flights of steps, one on north-west and one on south-west corner. Both the staircases lead the visitor into the western end of the mandapa. Mandapa is supported on twelve pillars, in two rows of six pillars each, and twelve pilasters, six on either side. Pillars are plain squares with ornamentation just below the capital area. All the pilasters are adorned with life size statues. There are total of twelve images. Starting from south-west on southern wall, a male figure with a dagger in his waist and a bow and arrows on shoulders, Cunningham suggests that it could be Rama. Next is a female standing on lion pedestal and two flying kinnars on top. Next is a couple where female is taller then the accompanying male and she is holding the neck of her male company in very peculiar manner. Local people says that this is an image of Sita, the wife of Rama. However this image represents a amorous couple as the male is holding a snake which is a symbol of sexuality and there is a parrot as well over a tree which further supports this hypothesis. Next in line is a status of Ganga standing over a makara and accompanied with an attendant who is holding an umbrella. Next is a statue of Narasimha. Next is a statue of dvarpala. Now on northern wall, starting from north-east, first is an statue of dvarapala similar to its counterpart on the opposite pilasters. Next is depicted Varaha incarnation. Next in line is Yamuna standing over a tortoise. Next is a statue of a female standing over a lion pedestal where three lions are carved. Next is an image of Durga who is shown with eight hands and sitting over her mount, lion. Last in line is a statue of a male who is holding a dagger in his waist and riding a horse chariot of five horses, Cunningham suggests that it could be Surya. The sanctum is of 20 feet square from outside. Above this square rises apyramidal shikhara (tower). This shikhara is consisted to four tiers having small shrines on all corners. There are four chaitya-niches on each side of the shikhara. There is a circular griva (neck) which rests above the fourth tier. Above this griva is stepped circular structure which is topped with an amalaka. Above the amalaka is finial. The height of this finial is approximately 50 feet from ground. There are two foundation inscriptions, one on southern wall and one on northern wall of the mandapa. Inscription on northern wall is dated to beginning of eighth century CE based upon paleographic studies. Its mentions construction of a Vishnu temple by a king of Nala dynasty. Another inscription, on southern wall of the mandapa, mentions construction of a Rama temple by Jagapala in 1145 CE. There is an image of Vishnu inside the sanctum hence the temple is dedicated to Vishnu but not to Rama, though both represent one and same god. Scholars suggests that the later inscription must be referring to repair done by Jagapala but not of construction as the temple was already there. There are two possibilities, either we may assume that Jagapala enhanced the temple by constructing subsidiary shrines and compound wall or the inscription slab does not talk about Rajiv-Lochan temple but some other temple. However no scholar has proposed the later theory so I assume that it is not tenable on some ground otherwise they would have thought about this. But if we accept the repair theory then why the inscription mentions temple of Rama? Is it because this temple was known as Rama temple by the time of Jagapala? But why as the image inside the sanctum is clearly depicts Vishnu attributes. Also standalone image of Rama is very rare to find as he is usually accompanied with Sita and Lakshmana. Rajim grant of Tivaradeva – Gupta Inscriptions by J F Fleet – written in Sanskrit, box-headed variety of central Indian alphabets – dated in seventh regnal year, 667 CE – This grant was found 5-6 feet underground the temple. The grant was issued from Sripura (Sirpur) and mentions a grant of village by king Tivaradeva of the Panduvamshi family. Stone slab on northern wall of the mandapa – Epigraphia Indica Vol XXVI – Kutila script and Sanskrit language – dated to beginning of eighth century CE on paleographic studies – Inscription starts with obeisance to Vishnu and then mentions glory of King Nala, of Nala dynasty of Mahabharata. It then mentions King Vilastunga and his predecessors Prthiviraja and Viruparaja. It then tells that king Vilastunga built a temple of Vishnu – composed by Durgagola and engraved by Durghasti. Stone slab on southern wall of the mandapa – Corpus Inscriptionum Indicarum Vol IV part 2 – 19 lines in Nagari characters and Sanskrit language – dated in year 896 of Kalchuri Era (1145 CE) on Budha-dina or Wednesday, the eight tithi, called rath-ashtami, in the bright fortnight of the Magha month – The object of the inscription is to record construction of a temple of Rama (it should be taken as repair and not construction as the Rajiv-Lochan temple was already constructed prior of Jagapala’s time or this stone does not belong to this temple) and grant of the village Salmaliya for the purpose of the food offerings to the deity by Jagapala (later referred as Jagatsimha in line 10). After the customary obeisance to Narayana, the inscription traces the genealogy of the donor Jagapala from Thakkura Sahilla, the latter was the spotless ornament of the family of Rajamala and have come from the country of Vadahara (V V Mirashi suggests that it was probably situated in the country of Bhanjas whereas R B Hiralal identifies it with Badahara in Mirzapur district) . He made brave kings tremble in wars and brought the Vivarabhumi under his sway. Sahilla has a younger brother, Vasudeva, and three sons Bhayila, Desala and Svamin. They conquered the Bhattavila and Vihara countries. Jayadeva, elder son of Svamin, acquired the country of Dandora (V V Mirashi identifies it with former state of Sarguja which was once called Bais Dandor) containing 2100 villages, while the younger son, Devasimha, took Komo mandala (V V Mirashi identifies it with Pendra). Thakkuraini Udaya, who was the wife of one of the two sons of Svamin, was the mother of Jagapala. Next six lines detail about the accomplishments of Jagapala. The Mayurikas and Savantas were submitted to him. For his overlord, Jajalladeva, Jagapala conquered the Tamanala together with Ratha and Tera. During the reign of Ratnadeva II, he acquired the name of Jagatsimha by his heroic deeds in the Talahari country (V V Mirashi identifies it with southern part of Bilaspur) . But his exploits were even greater during the reign of Prithvideva II when he took the string fort of Saraharagadha (Kielhorn identifies it with Sarangarh) and Machaka-Sihava (R B HIralal identifies it with Mechaka-Sihava south of Dhamtari) and conquered countries of Bhramaravadra (V V Mirashi identifies it with Bhramarakotya near Bastar), Kantara, Kusumabhoga (V V Mirashi identifies it with Kusmurra of Dhamtari), Kanda-dongara (V V Mirashi identifies it with former Bindra-Navagadh area where a range of hill goes by name Kanda) and Kakayara. He then established the town of Jagapalapura in the newly acquired territory. He had three brothers, Gajala, Jayatsimha and Devaraja. – composed by Thakkura Jasananda, son of Thakkura Jasodhara of Ayodhyapuriya family – engraved by artisan Ratnapala. Pillar inscriptions – Descriptive List of Inscriptions in The Central Provinces and Berar – various pilgrim inscriptions are recorded on the pillars of this temple. Videshaditya, Purnnaditya, Vakaradhavala, Bhagavati, Ratnapurushottama, Manadevi, Salonatunga are the various names of pilgrims found in these inscriptions. However none of these names have any historic value. Rajeshvar Temple – This east facing temple is located opposite to the western entrance of Rajiv-Lochan temple. Like Rajiv-Lochan and other temples in Chattisgarh, this temple is also constructed over a jagati which is 2 feet 8 inches high. The temple is constituted of a mandapa, antarala and garbha-griha. The mandapa, 23 feet by 18 feet, is supported on two rows of pillars and a row of pilaster on either side. Ganga and Yamuna are present on two opposite pilasters at the entrance. There are statues on other pilasters as well. Sanctum of the temple is 15.5 feet square from outside. From inside it is guarded by two dvarpalas. Inside the sanctum is a Shivalingam known as Rajeshvar. A Nandi is placed in a small hall in between the sanctum and mandapa. Daneshvar Temple – It Shiva temple is situated very close to Rajeshvar temple on south. This temple is also built on a jagati and consists of a mandapa, antarala, Nandi-mandapa and a garbha-griha. Nandi-mandapa is not seen in any other temple at Rajim. Jagannath Temple – Jagannath Temple is near northern entrance of Rajiv-Lochan temple. There is a wooden image of Jagannath in its sanctum. Tradition says that originally there used to be a community of castes here, all eating together without distinction similar to Jagannath Temple. Then the Lord Rajib Lochan appeared once in a dream of a priest and asked him to discontinue this as his pilgrims are no more going to Jagannath as they obtain all desires here. Since then this eating together without distinction service is discontinued. Kuleshvar Temple – This Shiva temple is situated on an island formed by Pairi and Mahanadi rivers. Like all other temples of the site, this temple is also constructed upon a jagati (paltform) which is 17 feet high. However this jagati is octagonal instead of regular rectangular shape as seen in other temples. The temple is consisted of a sanctum and mandapa. Mandapa, 26 feet long, is supported on two rows of pillars and pilasters on side walls. Like mandapas of other temples at Rajim, this mandapa is also closed on sides. A female figure on outer pilaster is shown standing on a peacock. Cunningham suggests that this could be representation of Sarasvati as a river goddess. Kuleshvara Temple inscription – dated to ninth century CE based upon paleographic studies – This 20 line inscription is badly damaged. Mention of Srisangama is found in line 5, this Srisangama probably refer to the confluence of Pairi and Mahanadi rivers. 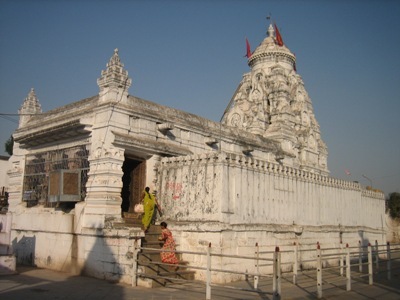 Ramachandra Temple – This temple is built about 400 years back by Govind Lal, a banker and merchant from Raipur. It is said that it has been built by material brought from ruins from temples of Sirpur. Many pillars have life size statues as seen at Rajiv Lochan temple. Two pilasters depict statue of Ganga which suggests that these were probably brought from two different temple ruins as we have never seen any instance where Ganga or Yamuna is shown twice. Inscriptions – A short inscription reading Sri-Lokbala is found on one of the pilaster. However as these were brought from Sirpur so what this inscription refer to is hard to say. The characters used are of eighth-ninth century CE. Other Temples – There are many temples at Rajim however these all are of not much architectural interest. Rajib Telin Temple is located west of Rajeshvar temple and has a sati stone like structure inside the sanctum. Two temples, Pancheshvar Mahadev and Bhuteshvar Mahadeva, stand side by side near the river bank. Someshvar Mahadev , a recent temple on the site of an ancient temple, is situated little away from the river in residential colony. How to Reach – Rajim is about 45 km away from Raipur. Rajim has a small railway station and connected to Raipur with a passenger train. Raipur is the nearest airport. Public transports are frequently available from Raipur for Rajim. Raipur would be a good option for accommodation. Cunningham, Alexander (1881). Report on Tours in the Central Provinces and Lower Gangetic Doab in 1880-81 (Vol XVII). Archaeological Survey of India. New Delhi. Mirashi, V V (1955). Corpus Inscriptionum Indicarum Vol IV Part 2. Archaeological Survey of India. New Delhi.